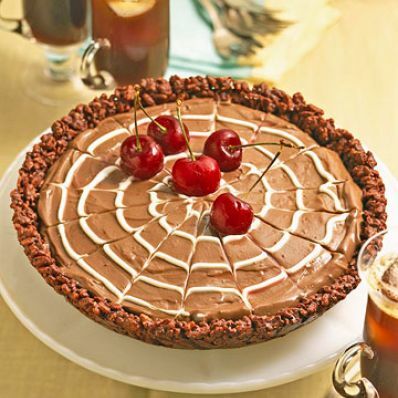 Mix crisp rice cereal and melted chocolate to make the shell for this easy chocolate pie. Once the shell is thoroughly chilled, fill it with chopped Bing cherries and chocolate pudding. 1 of 5 Heat together the chocolate chips and vegetable shortening in a small heavy saucepan over low heat, stirring occasionally, until the chocolate is melted and mixture is smooth. Remove saucepan from heat. Stir in the cereal and nuts; let cool slightly. 2 of 5 Line 9-inch pie plate with sheet of aluminum foil. 3 of 5 Spoon chocolate mixture into lined pie plate; spread evenly over bottom and up sides, but not over the rim. Refrigerate until the pie shell is firm, about 1 hour. Carefully lift shell out of pie plate; peel off the aluminum foil; return shell to pie plate. 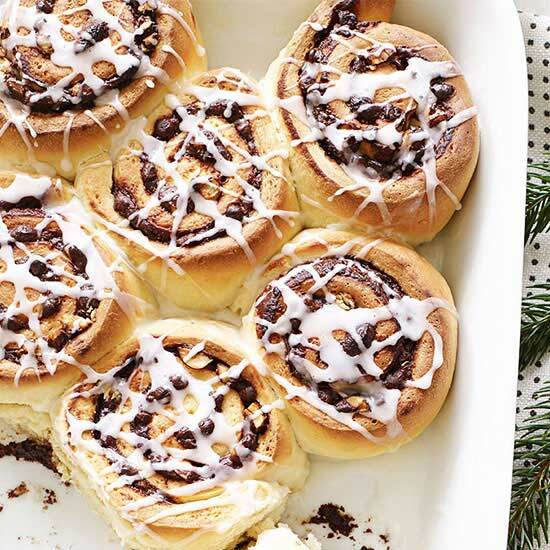 Refrigerate until ready to fill. 4 of 5 Set aside 1/2 cup of cherries with stems. Stem, pit and coarsely chop the remaining cherries; toss the chopped cherries with the kirsch in a medium-size bowl. Cover and refrigerate for at least 1 hour. 5 of 5 Whisk together 1 cup of the sour cream and the milk in a small bowl until well blended. Gradually and vigorously whisk the pudding-and-pie filling into the sour cream mixture until well blended, smooth and thickened (you can use an electric mixer, but pudding will not blend as smoothly as if mixed by hand). 1 of 3 Stir 1/2 cup of the pudding mixture into the chopped cherry-kirsch mixture. Spread evenly over the bottom of the pie shell. Spoon the remaining pudding mixture over the top, and then gently spread evenly to sides of pie shell. 2 of 3 Fill a pastry bag fitted with a small writing tip (or a small plastic food-storage bag with a small corner snipped off) with the remaining 1/4 cup sour cream. Pipe the sour cream, beginning in the center of the pie, in continuous spiral to the outer edge of pie, with about 3/4- to 1-inch space in between each spiral. Lightly draw a long wooden skewer or the dull back of a knife from the center of the pie through the spirals to the outer edge of the pie. Then make another line, drawing the skewer from the outer edge back to the center. Repeat drawing the lines, back and forth, around the entire surface of the pie, spacing as desired. Refrigerate for 1 hour to firm.